In 1996, Lisa Giguere received an MBA from Wilfrid Laurier University. She received a BBA (1990) and a BEd (1988) from the University of New Brunswick. 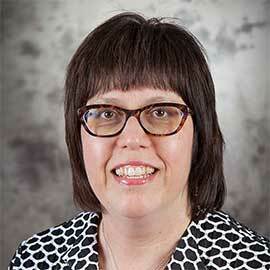 Lisa joined Laurier as a marketing instructor in 2004. She has taught BU 352 (Introduction to Marketing Management), BU 362 (Building and Managing Products, Services and Brands), BU 422 (Marketing Research), BU 412 (Services Marketing), BU 462 (B2B Marketing), BU 479 (High Tech Marketing), BU 632 (Marketing and Technology), and BU 682 (B2B Marketing). Prior to joining Laurier, Lisa developed an extensive background in marketing during a 14 year career with several organizations, notably GE and NCR. Writing cases, teaching with cases, course design. Honourable Mention, 16th Annual Administrative Sciences Association of Canada, Case Track, "Old El Paso: Make Tonight Taco Night" by Lisa Giguere and Fang Wang (2011). Honourable Mention, 14th Annual Administrative Sciences Association of Canada, Case Track, "fantastik All-Purpose Cleaners" by Lisa Giguere (2009). Best Case, 13th Annual Administrative Sciences Association of Canada, Case Track, "SlimFast Weight Management Products" by Lisa Giguere and Chatura Ranaweera (2008). Honourable Mention, 11th Annual Administrative Sciences Association of Canada, Case Track, "Casablanca Kids" by Lisa Giguere and David Rose (2006). Giguere, L. & Wang, F. “Old El Paso: Make Tonight Taco Night” case and teaching notes, published in Proceedings of Administrative Sciences Association of Canada Conference, Montreal, Quebec, July 2011. Dhalla, A. & Giguere, L. “My City Lives” case and teaching notes, published in Proceedings of Administrative Sciences Association of Canada Conference, Montreal, Quebec, July 2011. Giguere, L. “fantastik All-Purpose Cleaners” case, published in Contemporary Canadian Marketing Cases, 4th Edition, Herb MacKenzie (Editor), 2010. Giguere, L., “fantastik All-Purpose Cleaners” case and teaching notes, published in Proceedings of Administrative Sciences Association of Canada Conference, Niagara Falls, Ontario, June 2009. Giguere, L. & Ranaweera, C. “SlimFast Weight Management Products” case and teaching notes, published in Proceedings of Administrative Sciences Association of Canada Conference, Halifax, Nova Scotia, June 2008. Giguere, L. & Rose, D. “Casablanca Kids” case, published in Business Essentials 5th Canadian Edition with MyBusinessLab, Ronald Ebert, Ricky Griffin and Frederick Starke, 2008. Rose, D. & Giguere, L. “The Right Angle Café” case and teaching notes, published in Proceedings of Administrative Sciences Association of Canada Conference, Ottawa, Ontario, June 2007. Rose, D., Munro, H. & Giguere, L. “Want Beverages” case and teaching notes, published in Proceedings of Administrative Sciences Association of Canada Conference, Ottawa, Ontario, 2007. Giguere, L. & Rose, D. “Casablanca Kids” case, published in Contemporary Canadian Marketing Cases, 3rd Edition, Herb MacKenzie (Editor), 2007. Giguere, L. & Rose, D. “Casablanca Kids” case and teaching notes, published in Proceedings of Administrative Sciences Association of Canada Conference, Banff, Alberta, 2006.